What devices are people using on FINN.no? Mobile, tablet or desktop? We begin every new year by looking over the old one. This article will look over which devices and softwares people used on FINN.no in 2018. Nearly everyone in Norway is using either our web-site or our native apps, so our data reflects what the population is using. Desktop, tablet or mobile phone? So let’s start by looking at the devices people were using on FINN, regardless of whether they used our native apps or visited www.finn.no with a browser. Mobile is the most used device on FINN.no, and the trend is climbing. Desktop is falling to 20% while 10% use tablets. When we include both our web site and native apps, mobile accounts for more than 60% of our visits, and it reached 70% just before the end of the year. Desktop computers are the second most used devices, but their share is loosing what mobile is gaining. The year started with 25% ratio and ended with less than 20%. Tablets have a stable share around 10% throughout the year. Even when we only look at web traffic, mobile phones are still the most preferred device. This chart displays the device types used on our web site since 2016. Mobile phones overtook desktop computers early in 2017. Mobile phones overtook the throne from desktop computers in winter 2017, and the trend continued. At the end of 2018, 56% of the visits were by mobile, while desktop computers have dropped to 30%. Tablet usage has slowly fallen from 15% to 10% of visits, with some growth at the end of the 2018. Are people still visiting www.finn.no, or do they prefer our fancy native apps when they are using mobile? This chart shows that iOS and Android apps combined became more popular than our web site for mobile users in 2018. In the summer of 2018 we witnessed a remarkable shift. Native apps received more visits than our web site from mobile users. This is not the first time in we’ve seen this, but this time it seems to be permanent. People seem to download our apps when they go on holidays, and they keep to that habit afterwards. Visits from our iOS app have grown from 26% and reached 30% before a minor drop at the end of the year. The Android app has a similar trend, climbing from 22% to 24%. What kind of phones are people using? According to the media, Apple is losing ground on the mobile market, but this has yet to be seen in our statistics. To make it easier see longer trends, below are the statistics for the last 3 years. This chart shows the phone manufacturers who have ruled since 2016. Apple has a stable trend just below 60%, Samsung has a slow decline around 30%, and Huawei climbs from 2% to almost 10%. Apple still seems to control the Norwegian mobile market, as 54–58% of our visits are from iPhones, and this trend has been stable since 2016. Samsung however, seems to have had a more permanent decline from 30% to 26% during 2018. Even more so, Sony has dropped from 9% to 3% over the last 3 years. The runner up on this list, Huawei, only had a share of 2% in 2016, but now is reaching towards 10%. Hey, isn’t Apple dropping at the end of that chart? If you take a close look at the chart above, you may see something that looks like a dramatic drop in Apple’s percentage at the end of 2018. Is this the beginning of the end of the iPhone hegemony? No. A closer look at the data in the new year indicated that this was just a temporary drop. Apple’s percentage for the first week of 2019 was back at a stable 56%. OK, Apple seems to keep their ground. Does this also reflect on the operating systems on phones and tablets? This shows the operating systems on mobile phones and tablets. Apple iOS has about 60% and Google Android has 40%, but the gap is slowly narrowing. The answer is yes. Apple iOS is used on 60% of the visits from mobile phones and tablets throughout 2018, and 40% came from Google Android. However, iOS has slowly declined from 62% to 58%, while Android has had an equivalent climb from 38% to 41%. Whether this gap will continue closing, remains to be seen. A closer look further back in history shows that the distribution was 64% and 35% in 2016, so this seem to be a continuous, but not dramatic trend. Did anyone mention Microsoft Windows Phone? Never mind, they only have 0.1% of our visits. Do people update their phones? Short answer: yes! At least for iPhones. For Android it takes a bit longer. So let’s take a look on iPhones first. 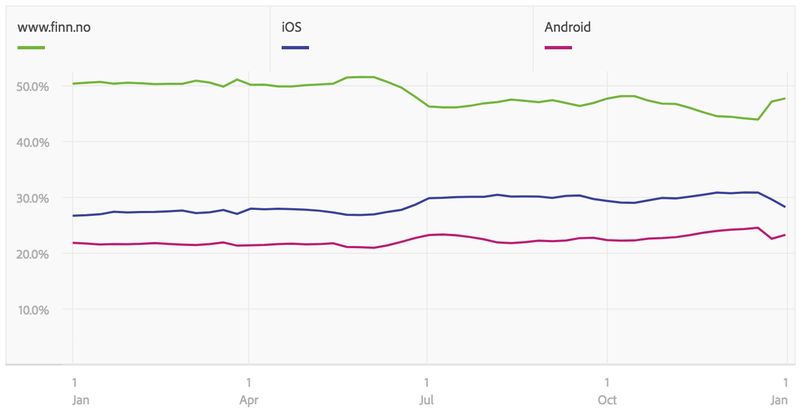 This chart shows that new releases of iOS quickly replace the old ones. After iOS 12.1 was released at October 30, it took 5 weeks until it reached its peak percentage at 53%. At that point it was time to release version 12.1.1. We see the same trend throughout the year that new versions replace each other pretty quickly. So what about Android phones? This chart shows that it took Android 8 five months to beat the older Android 7. Even though Android 8 Oreo was released in August 2017, it had only 3% of the visits in the beginning of 2018. Not until June did they beat the older version Android 7 Nougat. The major releases serves 50–60% of the visits, while the minor releases generally seem to be ignored. Android 8.1.0 had 12% of the visits at the end of the year, one year after its release. Be aware that all the charts above only show the most popular versions for the selected period. They might be missing some versions that would have filled some of the gaps. The browser war is not over, but fortunately there are now fewer developers among the victims. What’s the most popular browser for desktop users nowadays? Google Chrome have climbed above 50% since 2016, while Microsoft have fallen from above 30% to near 20% in the same period. Google Chrome has been the most popular browser over the last 3 years, and is still climbing, except for the last month of 2018. Microsoft’s browsers, whether it’s Internet Explorer or Edge, have had a similar decline from 30% towards 20%. Apple Safari and Mozilla Firefox both have about 10% of the visits, but Firefox seems to have lost about 5% in this period. Still having nightmares about supporting older versions of Internet Explorer? Things are changing slowly in Microsoft’s desktop universe, but they are changing. Remember from the chart above that Microsoft’s browsers had about 25% of the visits near the end of 2018. The following chart will show the percentages of that share. Internet Explorer 11 had a steady decline from 64% to 52% during 2018. The dramatic drop at the end of the graph recovered after new year. Newer versions of Microsoft Edge relieve each other at 30–40%. The good news is that Internet Explorer 10 and older are practically out. IE10 had just 0.1% of the visits in 2018. The bad news are that Internet Explorer 11 still clings to the top among Microsoft browsers. Over the year, it declined from 64% to 52%. New releases of Microsoft Edge quickly replace each other and keep a share between 30–40%, actually touching 50% by the end of the year. For iPhones, I don’t even bother to show a graph. That is Safari all over. Google Chrome has only 1.5% of the visits. The graphs for browsers on Android phones however, are a lot more fun. This rather confusing graph shows that the Android browser has 50% of the visits, various versions of Chrome have 30%, while Samsung browsers have about 10%. At the first glance the chart showing the different browsers used on Android is confusing, but 3 browsers stand out. On top is the Android browser (versions unknown), which stays between 50–60%. Secondly comes frequently updated versions of Google Chrome, each reaching 30%. Bronze medal goes to the not quite as frequently updated Samsung browser, who lies about 10%. The trends look very stable. People use their mobiles more than they use desktop computers. Chrome rules the desktop universe while Microsoft’s web browsers are still loosing ground, but Internet Explorer 11 will still be around for the next couple of centuries. Apple keep their mobile hegemony, but shouldn’t feel too comfortable. And finally, mobile users are now using our native apps rather than using our web site.